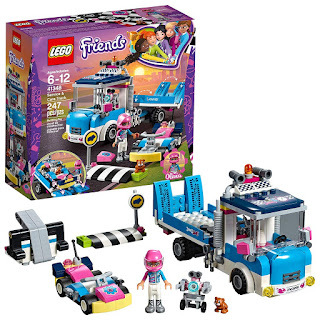 Head over to get this LEGO Friends Service and Care Truck 41348 Building Kit for ONLY $13.97 (Retail $19.99)! Olivia is always ready to rescue her racing friends with the LEGO Friends service &amp; care truck. Lower the ramp and use the rope and winch to pull the go-kart onto the tow truck and transport it to the Workshop area. Raise the go-kart up and check all is well underneath. This speedy LEGO Friends set also includes a go-kart launcher, a mini-doll figure, plus robot and hamster figures.